Spotlighting some newness here at the end of April. First up, horns, glorious horns! 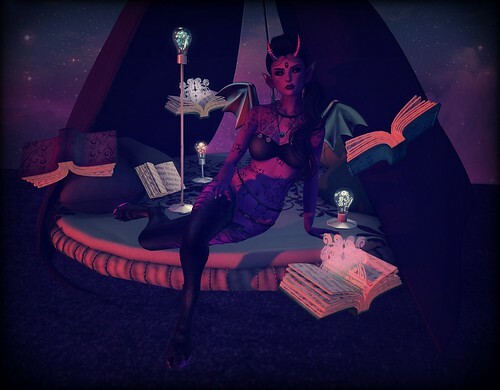 These amazing horns come from a collab between Aikea Reiko & Selos Dae and are currently available at the Fantasy Faire. There are a billion options and you can tint every option to further customize to your heart’s content. Next up, Sakuradawn Lei is back and has a new pose shop named Ex-Posed where she has a bunch of fun bento poses! I love how the hands look (especially with the crazy long nails from EMPIRE) in this particular pose from the Cassie set. I also appreciate that she does mirrors of all poses. And last up, me! I’ve made some new nail polish appliers that I hope to have available everywhere soon! And I’m also tweaking some non-human skin tones (like this pic’s deep teal) for an eventual release.. maybe.. hopefully. Ugh, I have had the flu for over two weeks as of today. So, since I look like hell I decided it would be nice to, at least, make my avatar look pretty. So here she is, kitted up in Lassitude & Ennui and looking like a total goddess. I, for one, am jealous. Just in under the wire, goodies from Fantasy Faire! I couldn’t resist all the unicorn yummies from Trap & Gauze. My pic doesn’t do them justice at all. I couldn’t seem to capture that amazing rainbow properly. Also not to be missed, the collaboration ears from Illusions and Trap! It’s been a harried past two months for me but things are finally starting to settle down. I’ve got a backlog of pretties I want to show off so let’s get started. I think I might just have a thing for the whole succubus aesthetic. 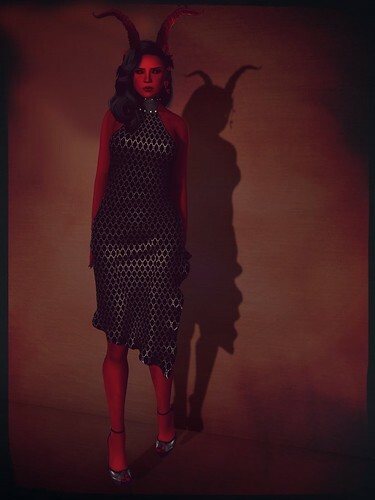 This look is a bit on the riskier side for me but this dress from -Pixicat- caught my eye at the Pulse fundraiser and I just had to have it. The Pulse Fundraiser event is going on now and all proceeds go to support the families and victims of the horrific shooting at the Orlando nightclub. A sneak peek at skins coming soon! Why was I not informed of Gauze’s fabulous Digi-Legs earlier?! Well, I have them now and I am in love!